Caro and her mum move to ‘a house at the top of a hill’ and when Caro discovers that everything in the house is white - white walls and ceilings and doors – she feels lonely and wishes for friends. Magically, a cuddly white lion materialises from the wall and suggests a game of hide and seek. The almost mystical illustrations of this satisfying picture book show us child and lion sharing wonderful times together. 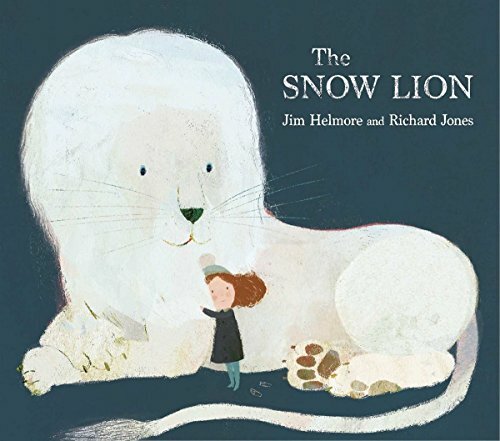 No parents, no adults at all, but a lion who gently leads Caro to the realisation that she can find friends in the outside world, and that these friends will bring colour into her life. Mum (although we don’t see her) also brings colour by inviting Caro’s new friends in to paint the walls so they are no longer white. This means that Caro cannot see her lion friend anymore, and she is sad until snow comes and he is once again visible. She learns that he will always be there if she needs him, and she is able to get on with her life and her friends in this knowledge. Perfectly imagined and gloriously painted, we see Caro come through a difficult experience by using her imagination and inventing a being to help her through. The pictures have plenty of detail (there is a companionable black cat throughout) and yet are given space to develop the theme. From the dark of the night of Caro and her mum’s arrival, to the brightness of the interior of the house, to the colour that comes along ultimately – all this mirrors Caro’s moods and her adjustment to her new situation. A beautiful book which will repay reading many times.